It’s hard enough to go Paleo if you’re doing it with a supportive group – maybe a friend, or a gym community, or just your family deciding to make it happen together. But what do you do when you’re the only person in the house who’s willing to take the plunge? What if your significant other (or roommate) is apathetic about the idea of diet change, and unwilling to even try it? Can you still take the Paleo leap all alone? It’s a lot harder, there’s no getting around it. But by starting off right, using some strategic techniques for discussing and negotiating food issues, and sticking to your guns, you can help make it a lot easier for everyone. There’s a reason why everyone advises you to throw out your old food when you change your diet: out of sight is out of mind, and out of mind is out of mouth. 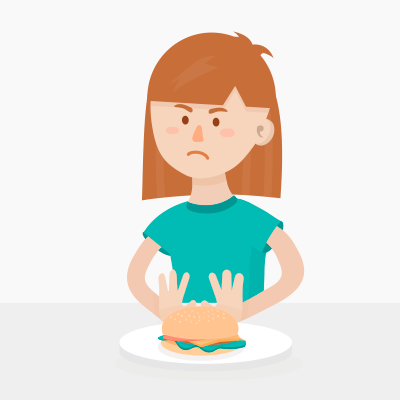 We all want to believe that we can just use willpower to keep our hands out of the cookie jar, but willpower is limited and it wears out fast: a better strategy for long-term success is to set up your environment to avoid the need for willpower at all. Leave you one cabinet or fridge drawer just for Paleo food. Stash bags of chips (or whatever else is tempting you) in the cabinets where you don’t have to look at them. Put some healthy food that everyone can agree on (fruit is a good one) out in visible places, so it’s the first thing that comes to mind for snacks. This isn’t quite as good as a Paleo-only household, but it’s a big help. You already know that just descending out of the blue and imposing a diet makeover on everyone in the house is not going to end well. That’s disrespectful and completely counterproductive. How would you feel if someone else in the house decided to do the same with a vegan diet? That’s why it’s important to always phrase this as your choice: you’re not trying to force Paleo on anyone else. And you have to mean it, too: don’t try to “convert” other people to your way of eating, or start giving them dirty looks when they reach for the breadbox. It helps a lot to plan ahead for this. In particular, make sure that your choice isn’t creating a whole lot of extra work or sacrifice for everyone else. The pressure is on you to present Paleo as something that everyone can live with, especially if you’re living with your family and not just roommates. Unfortunately, this means that during the initial learning curve, you’ll be absorbing all the extra time it takes to figure out how you can make Paleo work for you – without complaining about it or letting the extra effort make you snappy to everyone else. This isn’t fair: everyone deserves to be cut a little slack when they’re doing something as hard as changing their whole life. But if you’re constantly grumpy from the stress of fighting your sugar cravings, the take-home for the rest of the household will be: “Paleo is miserable.” The more pleasant and cheerful you can be, and the less extra work everyone else has to do to make Paleo possible, the more smoothly the whole transition will go over. It’s all very well to say “your choice, your effort” to a twentysomething living with roommates, but what about the parents who have to cook for their families, too? Who has time to cook two dinners when it’s so hard just to get one on the table? Nobody, that’s who. And nobody should be expected to: home-cooked meals from Mom (or Dad!) are a rare and precious privilege, not a right. So how can you minimize the changes to everyone else, keep yourself on the Paleo straight and narrow, and have a life outside the kitchen? You can cook the same meat and vegetable dish for everyone in the household. Make those Paleo-friendly. Then just adjust each person’s serving of the other items to account for their dietary preferences. Everyone else gets pasta, meatballs, and cabbage; you get a sweet potato, a bigger helping of meatballs, and cabbage. The only extra effort required on top of the “normal” meal of spaghetti and meatballs is the 30 seconds it takes to poke a few holes in the potato and pop it in the microwave while the rest of the meal is cooking. 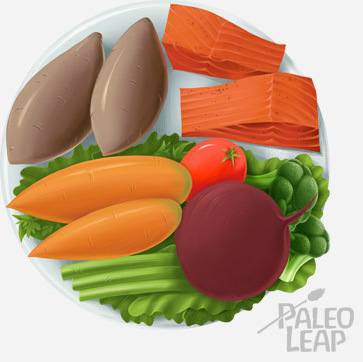 Another option is to make “stealth Paleo” food. Vegans are familiar with this tip: if you tell someone you baked them a “vegan cake,” they’ll assume it’s disgusting, but if you give them a slice of the very same cake and tell them it’s just a cake, they’ll like it. Breakfast: tomato basil frittata with home fries. Lunch: beanless chili and fall vegetable salad. Dinner: sun-dried tomato chicken with pesto mashed potatoes and asparagus ribbons. That’s practically a gourmet restaurant menu – probably better than the typical American family is used to eating. And it just so happens to be Paleo as well. Fancy that. If you decide to go this route, don’t rely on Paleoified treats like Paleo cookies or Paleo cake. It probably won’t taste the same and it just highlights that you’re trying to change the family menu. Instead, just casually cook something healthy and don’t bother mentioning that it’s Paleo at all (the advice in this article on sneaking vegetables into other foods might also come in handy!). Going Paleo all by yourself isn’t a walk in the park, no matter how well you prepare for it or how supportive your non-Paleo family is. Learning how to navigate family food traditions, favorite restaurants, and social events while eating a completely new and different diet is hard, and it does have a learning curve. It’s OK. Give yourself a break. Paleo success is about having generally good habits, not being perfect all the time; if you slip up sometimes, it’s not the end of the world. But then again, going Paleo isn’t easy even for people with complete control over their own kitchen. And there’s also a bright side to learning how to manage your own diet in a non-Paleo household: it’s great practice for traveling or any other time when you don’t have total control over your own food. By the time you have to manage the continental buffet on a business trip, you’ll be well versed in finding healthy options, avoiding temptations, and calmly carrying on with your own food choices even when other people are choosing something else.